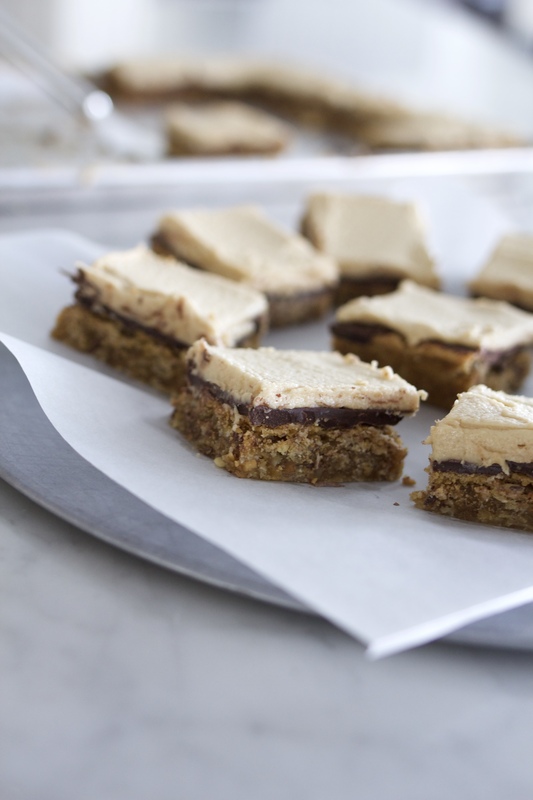 Perfected Peanut Butter Bars are not your mother’s Peanut Butter Bar! Thick, chewy, creamy and the perfect blend of peanut butter and chocolate in a homemade bar cookie. Peanut butter, and chocolate. It’s a perfect marriage. They are better together, than alone. They compliment each other in most situations: ice cream, candy bars, cakes, cookies. Who doesn’t love a good chocolate peanut butter dessert? Almost everyone loves a good peanut butter-chocolate combo. Take, for instance the best candy bar IN THE WORLD – Reeses Peanut Butter Cups. I love them frozen, melted and at room temp. I also LOVE Baskin- Robbins Chocolate Peanut Butter ice cream. Big, thick ribbons of peanut butter. Seriously. Delicious. And the best chocolate peanut butter ice cream I’ve eaten. 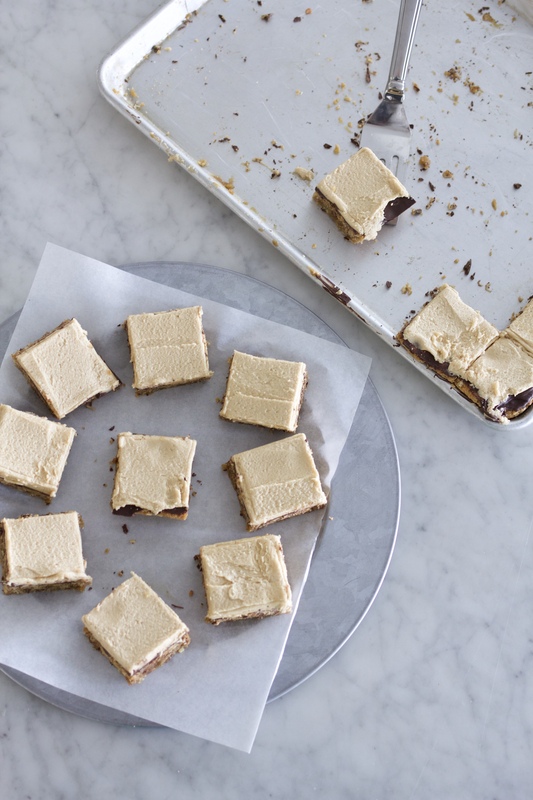 Why you need this recipe for Perfected Peanut Butter Bars! 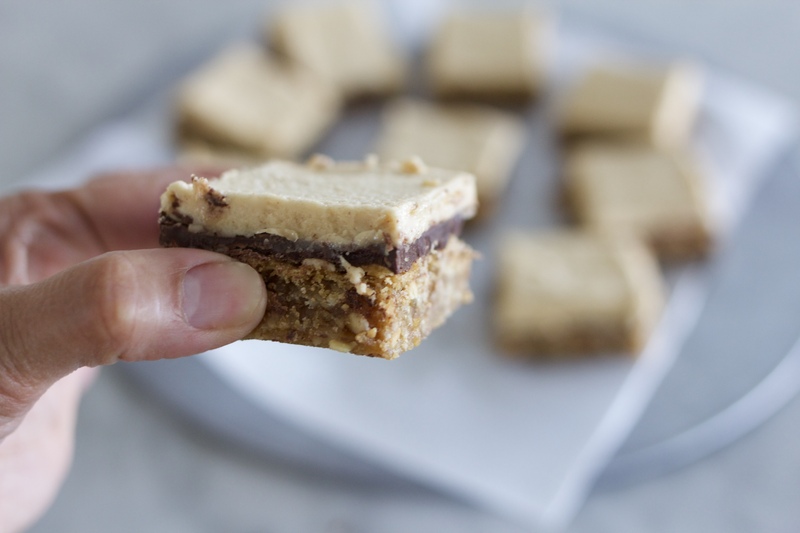 Perfected Peanut Butter Bars were one of the first recipes I posted way back in August of 2008. I was on the quest for the perfect peanut butter bar. Thick and moist, with a substantial layer of chocolate on top, a peanut butter bar that you can really sink your teeth into! It had to have a thick layer of frosting, without being too heavy on peanut butter flavor. After many test batches, and gaining a pound or two (for the sake of science) it was perfected. Thus the name! Since that time, I’ve also recorded the quantities of ingredients so it yields either a 9×13 pan (about 2 dozen pieces) or the larger quantity recipe which bakes up perfectly in a jelly roll pan and will yield about 48 pieces. 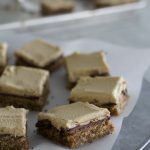 I love recipes that fit into a jelly roll pan for large crowds such as Sheet Pan Sour Cream Cookies, Graduation Brownies and Coconut Lime Bars! This recipe, broken down is really simple. 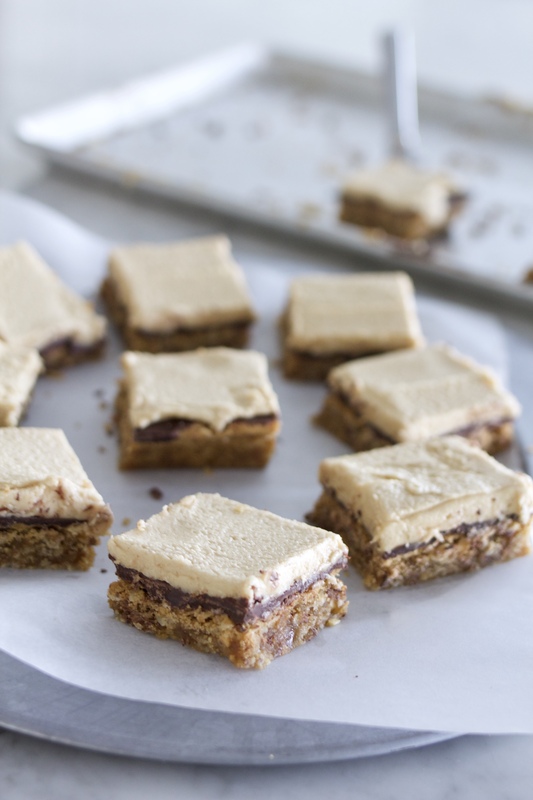 Perfected Peanut Butter Bars are basically a peanut butter cookie layer, smothered with melted chocolate chips and topped with with peanut butter frosting. Bar cookies are one of the easiest desserts to make when serving a crowd because most of the work is done in one bowl and one pan. When covered, this treat may be refrigerated and will stay fresh for a couple of days before serving. I lay a piece of parchment paper or wax paper over the top of the frosting after it has set up for a few minutes, before covering with plastic wrap. I know you’re going to love this recipe for everything from Sunday dinner to family reunions! Preheat oven to 325 degrees and place rack in center of oven. Cream butter, sugars and peanut butter until smooth on medium speed. Add eggs and vanilla and beat until smooth on medium speed. Turn off mixer and add flour, oats, salt and baking soda to bowl. Pulse mixer or mix on low until ingredients are incorporated. I pulse the ingredients, then use a large silicone spatula to scrape the bottom of the bowl and fold until the ingredients are all mixed together. Bake for 18-20 minutes for 9x13 or about 20-25 minutes for 11x18 jelly roll pan. Remove from oven and turn heat off. Sprinkle chocolate chips onto top of cookie layer. Return to oven for 2 minutes. Remove pan again and using a knife or offset spatula, spread melted chocolate chips evenly over cookie layer. Let cool completely on counter, or place in fridge to speed up cooling process (see recipe notes). Make peanut butter frosting by creaming softened butter and peanut butter together in a large bowl. Add powdered sugar, dash of salt and milk until light and fluffy. Spread on top of cooled chocolate mixture. -Do not use "Natural" peanut butter. Natural peanut butter is too soft and runny and will not work in this recipe. I suggest Skippy or Jif brands. Smooth is best. If you use chunky, the frosting will not turn out smooth. -I speed up the cooling process by refrigerating an additional jelly roll pan before starting recipe. When the pan of cookies is ready to set up, after melting chocolate chips on top. I place the pan on top of the cooled pan in refrigerator and let cool inside of the refrigerator. This usually takes about 15-20 minutes. That’s my fav. ice cream too! The chocolate ice cream with swirls of P.B. I can’t wait to try this recipe. It looks so good. I’ll let you know how it turns out. Thanks!! I was one of the recipients of the test batches, and it was gooooood! Ilove pb and chocolate too. I love anything and chocolate, but this was especially great! I ate 1/2 the plate she brought over to my house- I was trying to help my husband diet. Wowww. My husband has a serious chocolate/peanut butter jones. I can’t wait to surprise him with these bars. And the photo! It’s crazy-good. Love your blog. The recipes are outSTANDing!! The pan you used may be the problem. It is best to bake these in a glass or metal pan, light in color if possible. Help! I’m making these for a youth activity tonight and the frosting is the consistency of dough! It’s very hard to spread… What did I do wrong? I am not sure why this frosting did not turn out for you? If it happens again, I would add milk to spreading consistency! Why can’t I️ get the chocolate chips to spread? They were in the oven for over 10 mins and still won’t melt…. 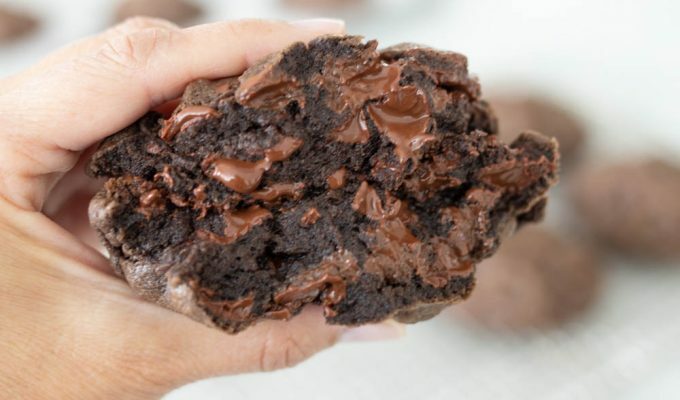 It takes just a few minutes for the chocolate chips to melt. The will melt even out of the oven if placed on the hot cookie dough immediately after removing from oven. What type of chocolate are you using?